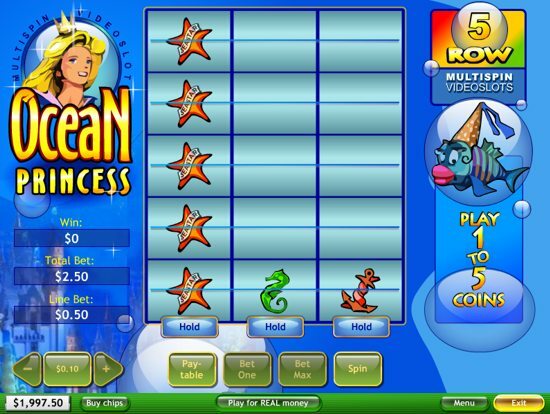 The object of Ocean Princess is to obtain a winning symbol combination by spinning the reels. · Click Bet One or Max Bet to select the number of coins you wish to wager. Each click on the Bet One button wagers one more coin. Pressing Max Bet increases your bet amount to the maximum amount possible – that is five coins (or less, if you do not have enough balance) – and spins the reels automatically. Remember that your total bet is five times the bet on one row. You can see your remaining credit, the bet amounts and win amount on the machine left of the reels. · Click Spin (if you did not press Bet Max) to spin the reels. · After the reels stop, select the reels you want to hold, by clicking on the Hold buttons beneath them or on the reels themselves. Click on Spin again to spin the reels you did not hold. · If any of the rows show a winning combination after they stop, you win according to the winning table. Click the Paytable button to see the paytable, if you wish. Flip the pages with Next/Back, and close the paytable with Close. You can also click the Paytable button again to close the paytable. The tables show a winning amount for every symbol combination that deserves a win. This amount corresponds to €1 line bet. If you are playing with a lower or higher line bet, your winning amount will be different respectively. Multiply your line bet by that number and you get the winning amount. If you have winning combinations on multiple lines, add them all up to get the winning amount. The golden crown with the word “Wild” written on it, is a wild symbol – meaning it stands for any other symbol, like a joker in card games. Note: The three wild symbols pay 1000 x line bet only if you play for max bet. Otherwise they only pay 250 x line bet.